A brand new poll by The Right Strategy Group has businessman Kevin Stitt leading former OKC mayor Mick Cornett by 9%. 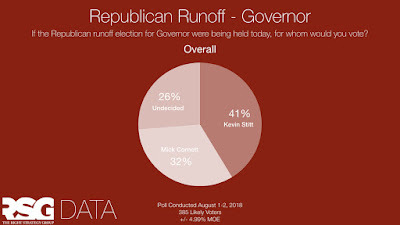 In the poll, conducted this week, Stitt received 41.3% to Cornett's 32.6%, with 26.1% undecided. In general election matchups, Democrat Drew Edmondson led Cornett 39.4% to 39.2% and Stitt 42.4% to 40.9%, both well within the margin of error. RSG also surveyed the GOP Lieutenant Governor runoff, finding Dana Murphy at 29.6%, Matt Pinnell at 25.4%, and 45.0% undecided. You can view the crosstabs here.